This recipe intrigued me as not only it sounded like a great foil to the richness of sausages and potatoes, but also as a great reason to buy fresh horseradish for the first time! I was surprised at not just the complexity of flavor in this dressing, but how versatile it felt. It was admittedly a bit of work grating fresh horseradish, I have my husband to thank for that tough bit of the job. But after that its as easy as shake, mix, eat. 1. Whisk together oil, juice, parsley, shallot, mustard, and salt and pepper. Add in horseradish in stages, start with half and combine well, taste. Add more as your taste allows. Set aside to allow flavors to meld. 2. Place salad greens in a large bowl, add dressing and toss gently to combine. Top with radishes, cucumber, and avocado. The concept of warm potato salad was lost on me before making this meal. I always think of potato salad as a gloopy side dish at an outdoor picnic or bbq. This is on a whole other level. Bacony, tangy from mustard and vinegar, deliciously warm melt in your mouth potatoes. Words don't do justice to this iconic dish. Just make it already, and thank me later. 1. Place potatoes and 1 tablespoon salt in large pot and cover with cold water. Set over medium-high heat until boiling. Reduce heat to medium and simmer until potatoes are fork tender, 10-15 minutes. Strain potatoes and set aside. 2. While potatoes are cooking, cook bacon in a large skillet over medium-high heat until crisp. Remove bacon to a paper towel lined plate, leaving as much rendered fat in the pan as possible. If there is more than 4 tablespoons worth of bacon fat in pan, feel free to pour some out. 3. Add onions to pan with bacon fat and cook over medium heat until lightly browned and carmelized, about 5 minutes. Remove from heat and set aside. 4. In a mason jar (or small bowl) add vinegar, sugar, mustard, 2 teaspoons of salt, and pepper, put on lid and shake, to make the dressing. 5. Place potatoes, bacon, onions, parsley, and chives in a large bowl. Add dressing and toss gently to combine. Let sit for 10 to 15 minutes to allow flavors to combine, then serve immediately while still warm. What a race! So many unexpected turns of events and what felt like a redemptive victory for Hamilton after his loss at Silverstone and his break down in qualis on Saturday. From being slumped over his car almost in tears, to jumping in celebration in tears of joy, what a difference a day makes! With rain and a mixed up pack, this race was destined to be an exciting one and it didn't disappoint. It is always a shame to see a driver crash out at their own home race, especially when they are destined for victory, but it is all part of the game! Vettel will bounce back and lives to fight another day. Thinking about Germany always makes me immediately crave brats. I know there is more to their cuisine than that, but who am I to deny a craving? Brats can be done in many ways, but a favorite for me is poaching in beer and then either grilling or pan frying until just crispy on the outside and still juicy on the inside. It's a pretty easy dish to make without a recipe, but in case one would help: Sausages Poached in Beer recipe from 2016. If you are not much of a cook-with-beer fan, these are great even just poached in some water or chicken stock and then pan fried at the end. To go along with it this year I made the ubiquitous German Warm Potato Salad, which after tasting the first bite I realized why it is so ubiquitous, one word: Yum. In addition, we made a Mixed Green Salad with Horseradish dressing. 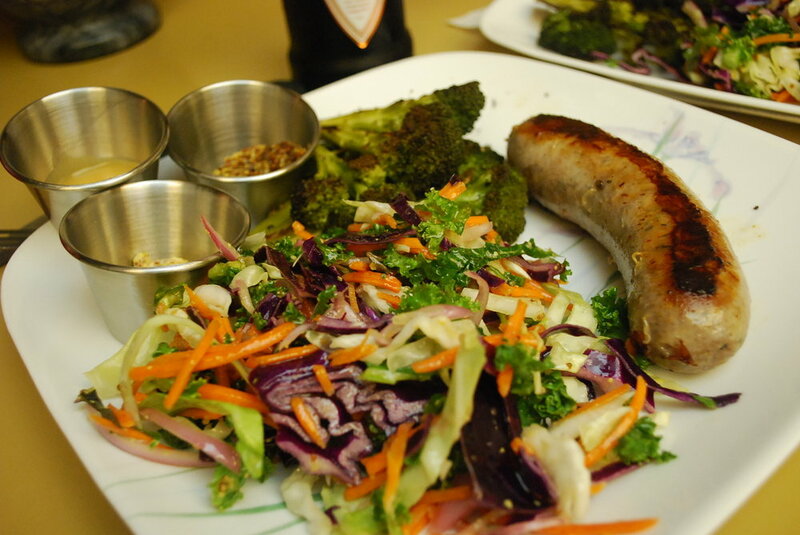 Surprising flavors all around, but perfect together with some savory brats. Last but not least, for race day snackage I tried my hand at Pretzels, so good! Not nearly as tricky as I expected and so delicious hot out of the oven. Dipped in some grainy mustard, we were in heaven. When it comes to sausage, Germany is pretty serious. There is a Wikipedia page with 42 entries of different German Sausages each with their own page. Well done Germany, well done. Pages in category "German sausages"
The following 42 pages are in this category, out of 42 total. This list may not reflect recent changes (learn more). They do somehow make room for other foods as well, such as slaw and of course mustard. Our good friends recently moved across the country and we inherited their fridge contents including about 15 mustards ranging from wasabi, kona honey, to smoky and tangy. Ooh yeah, plus BEER. We even got to use our new beer glass hand carried back from Germany by my in-laws. Bring beer to a simmer with garlic cloves in sauté pan. Add sausages, simmer for 15 minutes or until sausages reach 165 degrees. Once cooked at least 90%, remove liquid and add butter to pan, sauté until seared on both sides. In a small bowl, whisk olive oil, mustard, and apple-cider vinegar. Season with salt and pepper. In another bowl, combine kale, cabbage, carrot, parsley, and red onion. Season with salt and pepper, drizzle with dressing, and toss to coat.